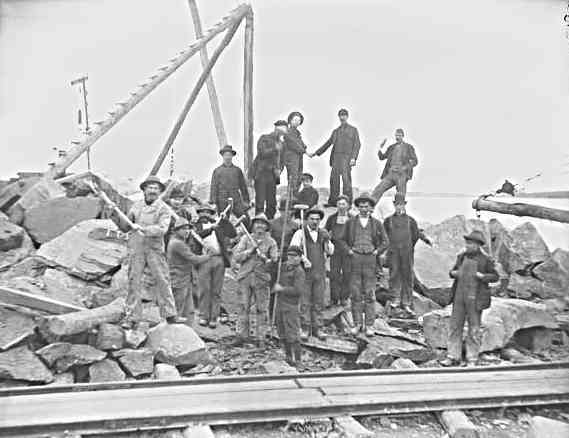 The Freeholder, Cornwall, ON – February 1, 1889 Davis & Co., canal contractors, have 120 men employed at work in their quarry back of Mille Roches. The quarry, which is situated on the farm of Wellington Manson, is one of the very best in this section. 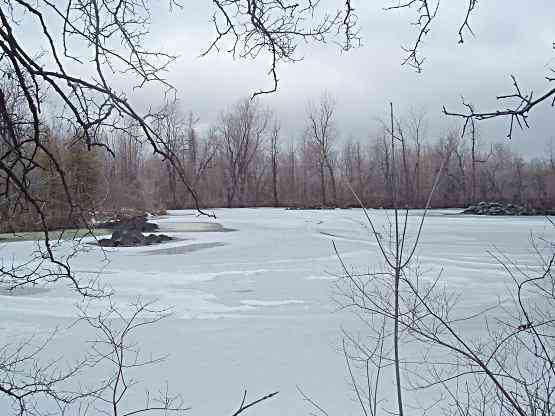 Hector Manson was Wellington’s grandfather, who on February 20, 1816, purchased the west half of Lot 25, 2nd Conc., 4th range, Cornwall Twp., from Daniel Campbell. This farm was divided and willed to sons John, Daniel & William in 1849. William sold his 1/3 (the part where the quarry is/was and Daniel willed his 1/3 to John in a will dated July 22, 1850 and registered September 10, 1858. “Wellington’s farm was the west 1/2, Lot 26(two small quarries near the west line). 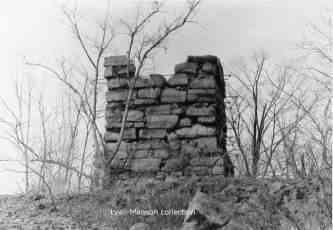 I think he later bought the back part of the Cutler property thus acquiring that part of the quarry mentioned above.” “The lime kiln quarry was on the east 1/2, Lot 27. The east end of it is very near the line between the lots and only about 200′ from Wellington’s two small quarries.” Lyall Manson. At some point the company Gypsum, Lime and Alabastine, (makers of plaster [of paris] and later drywall) from western Ontario, purchased a strip of land from the river to the western (lime kiln) property which included most of the corridor used by the “Donkey line”, the small train that transported the stones south to the canal. 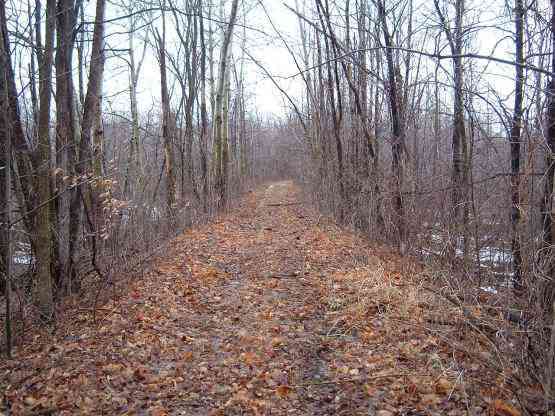 The land or possibly the company itself was purchased by Domtar in the early 1950s. 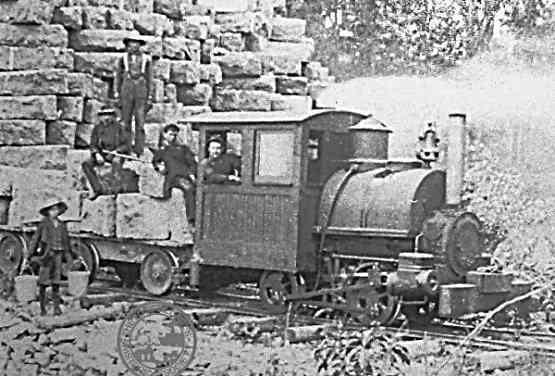 The “donkey” engine, hence the name Donkey line loading stone at the quarry. It is uncertain what became of this little engine but remains of the small carriages, most notably the wheels, were buried under the overburden pushed aside by the expansion of the modern day quarry on Richmond road. “I remember the rusty wheels and axles down in what we called the “scales”. The rails were still there perhaps up to the war. Jim McLellan told of running one of the cars along them.” Mr Lyall Manson. The small building in this photo most likely housed the machinery and winch used for stockpiling the squared stone and loading them onto the small railcars. The small opening that looks like a dog door, is where the cable ran through from the winch to the “gin” pole apparatus that lifted the blocks. The remains of a semicircular pit still remains and one can only imagine that this is maybe what it looked like a century or more in the past. 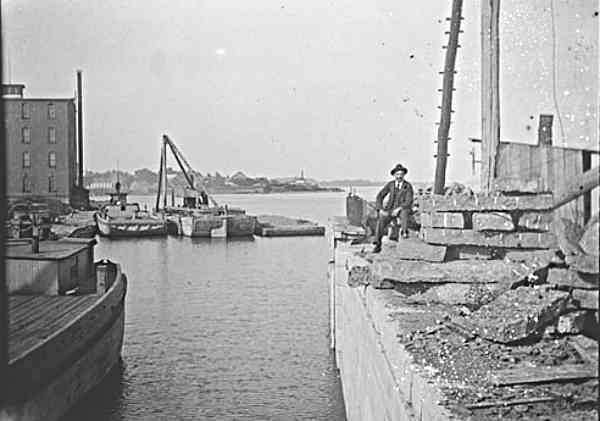 This photo taken by the river is believed to have been taken by the dock where the stone was loaded onto barges for transport by canal. It’s possible these stones and the ones in the photo below are destined for the construction of the New York Central rail bridge at Cornwall. At this time in history, blocks of stone were used in the place of modern day concrete, which was first invented by the Romans thousands of years ago but the recipe was lost until it was rediscovered during the canal building boom in the United States. 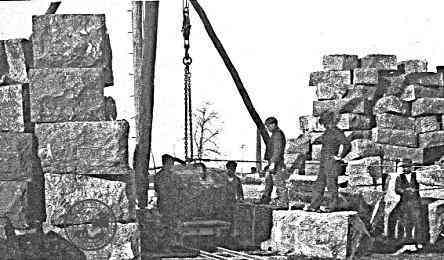 Stone blocks piled up at the locks in Iroquois, Ont. For an idea of how many blocks were needed for the construction of the various canals along the St. Lawrence River, one only has to go to Cardinal, Ont. and view the remains of the canal wall there with it’s thousands of blocks used for the retaining walls. 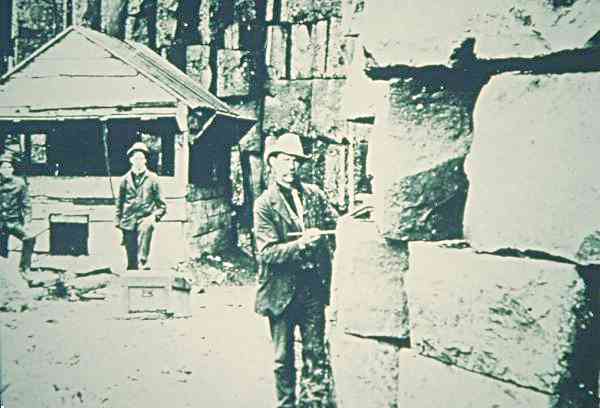 It seems to have been common practice that workers cutting the stone blocks were paid by the number of blocks that they cut and would therefore mark each individual block with a personal identifying mark or initial in order to get paid. 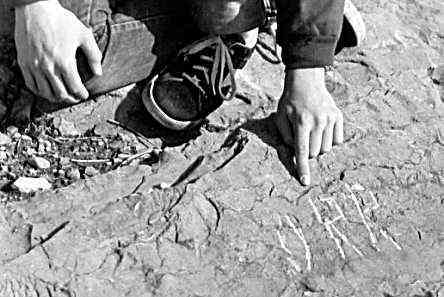 These identifying marks were obviously carved on the side of the block that wouldn’t be facing out and not the “good side” or the initials might also have been lost as the blocks were further worked, squared or trimmed before final placement. It was reported that during some restoration work at Lock 19 that a section of wall was exposed and the actual initials could be read on some of the blocks. There was a constant demand for lime because it was primarily used in the making of soaps. With the abundance of timber that was cut as farmers continued to clear their land, many lime kilns dotted the countryside. With an estimated height in the 30-40 ft, 10-12 meters, this kiln was by far one of the largest in the area. The outside walls, probably of smooth field stone were salvaged long ago, leaving only the reinforcing iron bars sticking out as witness to where the outside walls once were. 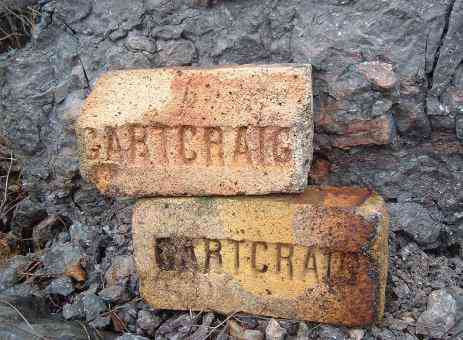 Scattered about the site where the lime kiln once stood are many of these old fire bricks. A few short sections of the old Donkey Line railway grade remain undisturbed but nearby industrial park is slowly but surely creeping closer. A view of the west quarry, looking north, the lime kiln would have been to the right just out of the photo. Twenty years ago several divers did a brief underwater survey of this quarry and discovered that the deepest part was barely 15ft or a good 5m deep, strewn with various sizes of rocks and littered with glass brought in by swimmers over the decades. The present day quarrying operation owns the property and work continues right next door as forest is being cleared adjacent to this spot and someday all this will be swallowed up by a much larger hole.